DustShield manufactures enclosures that are designed to help protect your equipment from various environmental factors. All DustShield Computer & Printer enclosures are built to NEMA-12 standards. NEMA-4 enclosures are available upon request. Our equipment protection solutions allow you to place electronic equipment in locations where the dust can potentially degrade the lifespan of the equipment. NEMA 1 – Indoor use to provide a degree of protection against falling dirt. NEMA 3 – NEMA Enclosures constructed for either indoor or outdoor use to provide a degree of protection to personnel against incidental contact with the enclosed equipment; to provide a degree of protection against falling dirt, rain, sleet, snow, and windblown dust; and that will be undamaged by the external formation of ice on the enclosure. NEMA 3R – Enclosures constructed for either indoor or outdoor use to provide a degree of protection to personnel against access to hazardous parts; to provide a degree of protection of the equipment inside the enclosure against ingress of solid foreign objects (falling dirt); to provide a degree of protection with respect to harmful effects on the equipment due to the ingress of water (rain, sleet, snow); and that will be undamaged by the external formation of ice on the enclosure. NEMA 3S – Indoor or outdoor use to provide a degree of protection agains falling dirt, rain, sleet, snow and windblown dust; and in which the external mechanism(s) remain operable when ice laden. NEMA 4 – NEMA Enclosures constructed for either indoor or outdoor use to provide a degree of protection to personnel against incidental contact with the enclosed equipment; to provide a degree of protection against falling dirt, rain, sleet, snow, windblown dust, splashing water, and hose-directed water; and that will be undamaged by the external formation of ice on the enclosure. NEMA 4X – Indoor or outdoor use to provide a degree of protection against falling dirt, rain, sleet, snow, windblown dust, splashing water, hose-directed water and corrosion; and that will be un-damaged by the external formation of ice on the enclosure. NEMA 5 – NEMA Enclosures constructed for indoor use to provide a degree of protection to personnel against incidental contact with the enclosed equipment; to provide a degree of protection against falling dirt; against settling airborne dust, lint, fibers, and flyings; and to provide a degree of protection against dripping and light splashing of liquids. 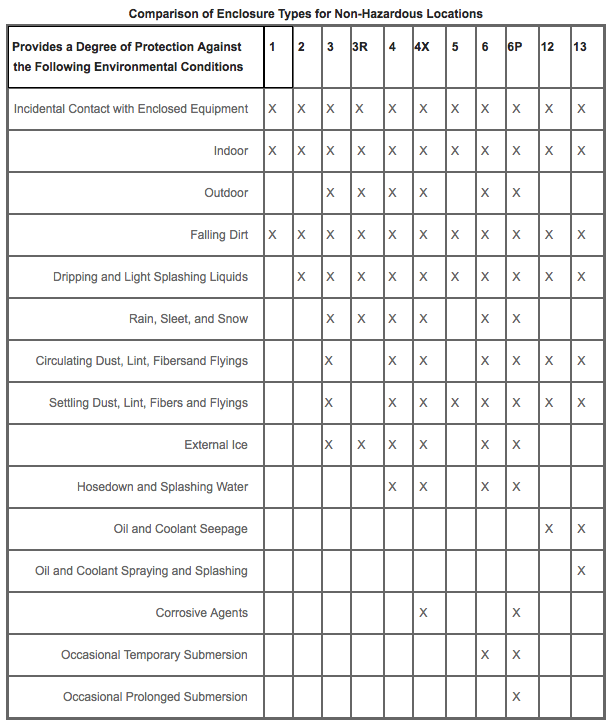 NEMA 6 – Indoor or outdoor use to provide a degree of protection against falling dirt; hose-directed water and the entry of water during occasional temporary submersion at a limited depth; and will be undamaged by the external formation of ice on the enclosure. NEMA 6P – Indoor or outdoor use to provide a degree of protection against falling dirt; hose-directed water and the entry of water during prolonged submersion at a limited depth; and will be undamaged by the external formation of ice on the enclosure. NEMA 9 – NEMA Enclosures are intended for indoor use in locations classified as Class II, Groups E, F, or G, and shall be capable of preventing the entrance of dust. Enclosed heat generating devices shall not cause external surfaces to reach temperatures capable of igniting or discoloring dust on the enclosure or igniting dust-air mixtures in the surrounding atmosphere. NEMA cabinets shall meet dust penetration and temperature design tests, and aging of gaskets (if used). NEMA 12 – NEMA Enclosures constructed (without knockouts) for indoor use to provide a degree of protection to personnel against incidental contact with the enclosed equipment; to provide a degree of protection against falling dirt; against circulating dust, lint, fibers, and flyings; and against dripping and light splashing of liquids. NEMA 12K – Same as NEMA 12 including NEMA cabinets constructed with knockouts. NEMA 13 – NEMA Enclosures constructed for indoor use to provide a degree of protection to personnel against incidental contact with the enclosed equipment; to provide a degree of protection against falling dirt; against circulating dust, lint, fibers, and flyings; and against the spraying, splashing, and seepage of water, oil, and non-corrosive coolants.